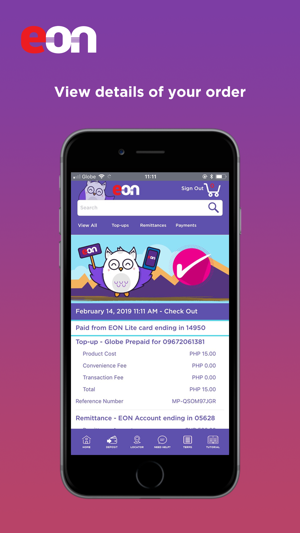 EON is the Philippines’ first and only neo bank, offering a suite of deposit, consumer finance, and payment products, leveraging on the latest technology to deliver an enjoyable experience, and complemented by agent branches nationwide. 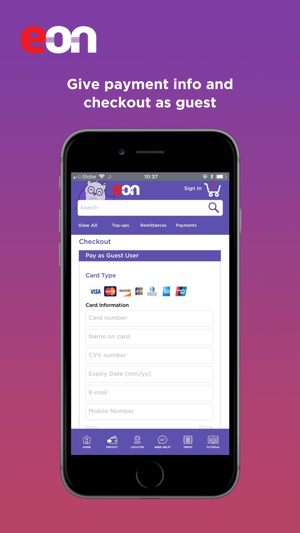 With the EON app, customers can open an account, apply for a loan, move money, pay bills, and buy prepaid credits, instantly. Experience banking like online shopping! No wifi? 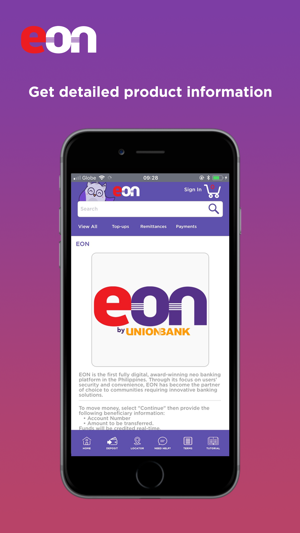 Access the EON app using mobile data on any network for FREE (except when on roaming)! Take your time and enjoy browsing through our products and services, select, and add to your cart! Move money to another EON account, a UnionBank account, or other bank accounts. Pay utility bills, school tuition fees, and other subscriptions. 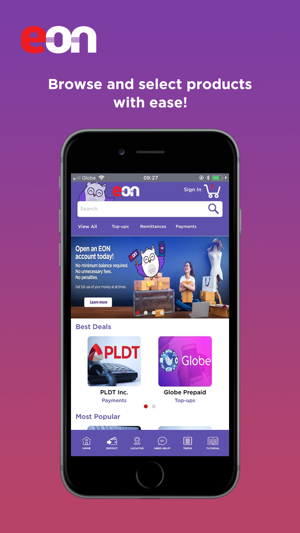 Buy prepaid credits for telco, gaming, cable, electricity, and a lot more. Plus, you can even apply for a loan! In a hurry? Don’t worry! You can check out quickly as a guest or you can sign up to enjoy more benefits. Once you sign up, choose how you would like to sign in: User ID, Touch ID, or Selfie. Whatever suits you best! Pay for your cart in one go. 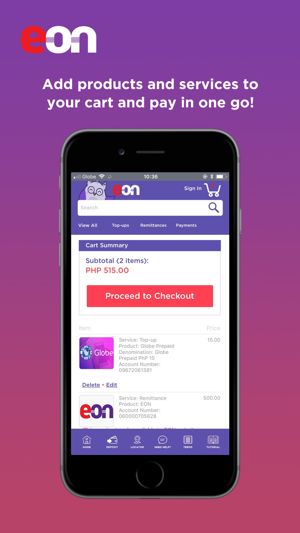 You may use your EON account, any Visa or MasterCard prepaid or debit card, or even your PayPal account! 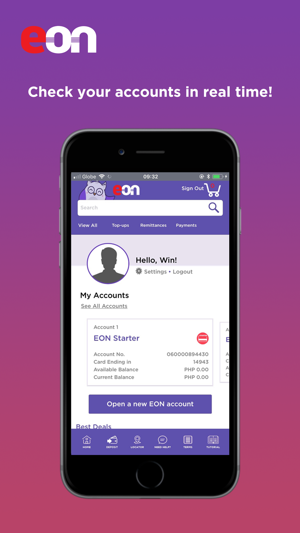 If you don’t have a Visa, Mastercard, or PayPal, open an EON account instantly for free! No minimum maintaining balance required nor unnecessary penalties. 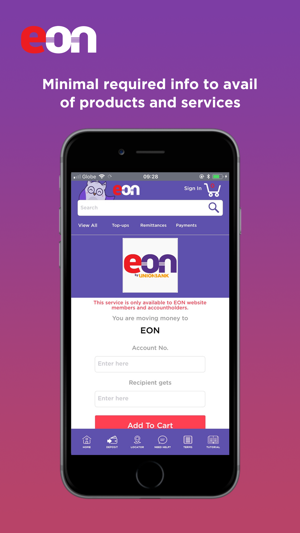 Get the most out of your money with the EON account. 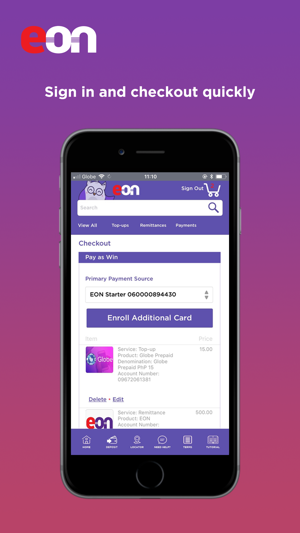 Also check out EON at https://www.eonbankph.com. Keep using EON! In this version, we have included new and updated features to give you a better experience. Need help? Hit us a message at heretohelp@eonbankph.com.